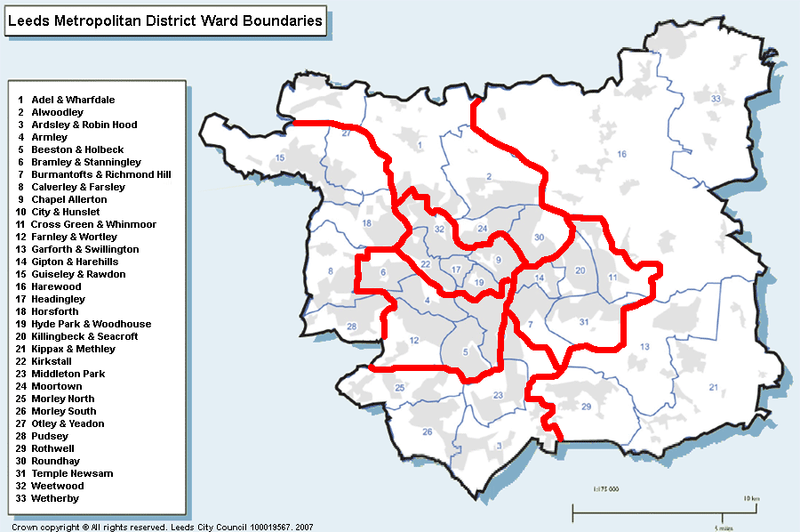 The City of Leeds has 7 and a half constituencies: Central, West, North West, East, North East, Pudsey, Elmet & Rothwell, and Morley & Outwood (shared with Wakefield). 2. The towns in the north west of the borough are put together with Baildon and half of Idle. 3. The other half of Idle is in a Pudsey seat that also includes Armley. 4. Half of Batley is combined with Morley and parts of the inner city. 5. The Outwood district of Wakefield has been put with Leeds city centre. Could they have done a worse job? Under pressure from politicians, the Commission has decided that, rather than respect our cities and communities, it will, for its own convenience, and the convenience of the politicians, split our cities apart. This is not just happening in Leeds – several other cities are affected, including Sheffield, Liverpool and Newcastle. That’s the best suggestion I can come up with at the moment, but there are other possibilities – you could maybe suggest an alternative. The main thing is that all the seats are in Leeds, where they belong. Great site, but I doubt the Commission will split wards. Correct me if I’m wrong, but difn’t the Tories present a plan that avoided crossing the boundary between W Yorks and N Yorks? I recognise that such a plan would still have crossed boundaries between W Yorks boroughs but at least it would avoid disrupting the existing pattern of seats in N Yorks.